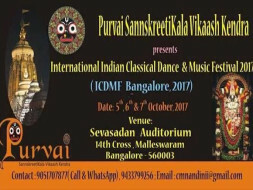 Purvai SannskreetiKala Vikaash Kendra is a social & non-profit cultural organisation which is dedicated to maintain, nurture & enhance popularity of our rich culture and tries to maintain the spirit of Indian Classical Dance & Music.
" 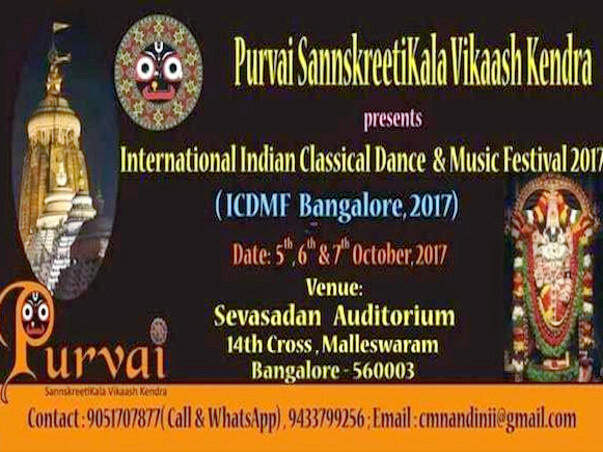 Purvai SannskreetiKala Vikaash Kendra " has great pleasure to announce that "International Indian Classical Dance & Music Festival ( ICDMF) , Bangalore " is scheduled to be held from 5th to 7th October, 2017. Art & Culture are the pillars of the Society.When a society leaves behind its legacy, it is often, the impact that we make through the creation of art. We have been conducting various Cultural Festivals in Recognized Auditorium like ICCR, Satyajit Ray Auditorium, Kolkata and Subhadra Auditorium, New Delhi in order to provide platform to the Artists,preserving and promoting our rich and diverse cultural heritage. Through Competitions, we offer opportunities to the Budding talents to showcase their talents in the morning and afternoon sessions. Being selected, we enroll their names in the Artist List and also give them the chance to perform in the Evening Session along with the Senior Artists, whom we invite to take part in this grand ceremony to motivate young performers who would look up to them. For arranging their accommodation, travel expenses and remuneration,we need a minimum of Rs 2,500,000. We require all the support that will help us to cover the minimum costs.Small or big, any donation at this point will help us and we are grateful for anything you can offer. We are a team of dedicated artists and art lovers. We will be inviting the donors who will donate us Rs 2500 or more in the Special Guest Section. Our vision is to pick up extraordinary talent and offer them platform and the golden opportunity to see and hear tr most eminent Gurus, Exponents & Choreographers. We are conducting events to reach out to every talent of this country but we are constrained by lack of funds.We are moving towards this crowdfunding campaign because of paucity of funds. We are also planning to continue these events in different zone of the Country like Hyderabad, Chennai, Bangalore , Kolkata , New Delhi, etc. But we are unable to meet the cost due to the scarcity of fund. It is one of the unique endeavours to preserve as well as promote the culture of peace, purity, love, joy, happiness in the society. Please take the initiative to support us in this endeavour by atleast contributing a small amount which will also encourage others to donate too and lend us a hand forward in this crowdfunding campaign to preserve and promote art . Thank you for being with us.